Danny Wilson has chosen to continue his career in the USA. Picture: Getty. They still talk about Kris Boyd in Portland. The Kilmarnock striker isn’t remembered for his goals during his time in the American Pacific Northwest, though. Instead, they remember his failure to meet expectations and his now infamous appearance in a TV commercial selling beds. The words “I want Parklane Mattresses on my team,” are now immortalised in American football folklore. Boyd was the last Scot to make a true impression in MLS, even if he was only there for a year, making only 26 appearances for the Portland Timbers. Since then, though, more Scots have made the move across the Atlantic. In fact, it could be pointed out that there has been a fundamental shift in the way Scots are viewing MLS. Danny Wilson is another Scot who has joined an MLS side this winter, the former Hearts and Rangers defender signing for the Colorado Rapids. 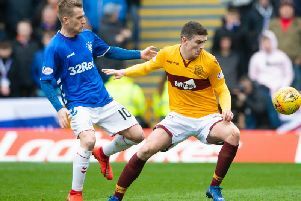 The centre-back’s hand might have been forced, with his Rangers contract set to expire at the end of the season, but he would have found a club in England. That would have been the default of most Scottish players, but instead he looked to the US. A trend is forming. Leigh Griffiths was linked with a move to the States last month, Sporting KC rumoured to be plotting a move for the Celtic striker. Last season, Sam Nicholson, right left Hearts for Minnesota United. In 2015, Shaun Maloney joined the Chicago Fire as a regular Scotland internationalist at the time. He might be Hibernian’s star man now, but before deciding to sign for the Easter Road club John McGinn was also extremely close to joining the Houston Dynamo. The midfielder spent a week training with the Texas side while Owen Coyle was the head coach there, with Houston confident that he would eventually sign. Had Hibs not entered the fray, he probably would have committed to a contract there. Increasingly, Scottish players are viewing MLS, and North American football in general, as a credible destination for them. What’s more, neither Russell nor Wilson has pitched up in MLS with the intention of picking up one final paycheque, as so many fading European stars have done over the years. Russell is 27, Wilson 26. These are two players who are entering their prime, viewing MLS as strong enough to provide them with a challenge during their best years as professionals. It is possible, perhaps even likely, that Russell enjoyed a bump in pay by swapping Derby for Sporting KC – he is one of the club’s so-called Designated Players, whose wage falls outside the league-wide pay cap –but he won’t be earning anything like the $6.6 million salary Kaka received at Orlando City last season. Russell hasn’t gone to Sporting KC for the money, he has gone for a fresh challenge. This represents a fundamental shift in the dynamic and the appeal of MLS, not just from a Scottish perspective. It’s not that there are necessarily more Scottish players making the move to MLS, it’s that those Scots who are darting over the Atlantic are of a higher calibre. Kenny Miller and Barry Robson played, for a spell, for the Vancouver Whitecaps, but both were well into the twilight of their careers by that time. Kenny Deuchar and Tam McManus are two more who once swapped Scotland for MLS, but neither was exactly a poster boy. Now, some of our very best are looking there. Russell and Wilson both have national team prospects. This presents a microcosm of North American football’s wider development. No longer is MLS the retirement league as it was once derided. Clubs are now spending their money on attracting bright, young talents, with many placing a focus on scouting South America, such as Miguel Almiron at Atlanta United and Diego Rossi at LAFC. That strategy has also created an opening for Scots such as Russell and Wilson. More will surely follow their lead.